Man opens fire on Florida school board before killing himself. A gunman killed himself after opening fire on a Florida school board meeting. He was confronted by two school officials, one who attacked him with her purse, and another, the security chief, who fired his gun at the shooter. 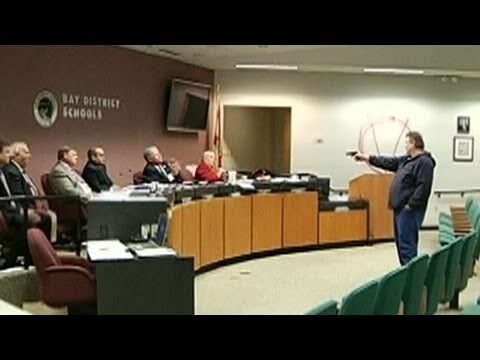 Police said a 56-year-old man disrupted the the Bay District School Board meeting in Panama City, Fla., walked up to the podium, pulled out a can of red spray paint and painted a large letter “V” with a circle around it. “The shooter approached the front of the board members, spray painted a symbol on the wall and fired an unknown amount of rounds,” said Panama City Police Department spokesman Sgt. Jeff Becker. EARTHQUAKE SWARM TO ROCK CALIFORNIA?